Despite a series of impressive wins in 1994, Illawarra fell short of a semi-final berth, finishing just outside of contention in 6th place. St George struggled in 1994. After starting with five wins from six, Saints then lost seven of their next eight matches eventually finishing 11th on the competition ladder. St George Dragons by 24-0. A crowd of 13,303 was on hand to see their home team score four unanswered tries. The Steelers had a series of big wins in 1994. Besides the Dragons, Illawarra also claimed the scalps of Easts (34-8), Brisbane (26-4), Parramatta (32-10), Gold Coast (30-14), Wests (40-18) and Cronulla (42-18). Sydney, Tues 14 June 1994: Tearaway St George forward, Gorden Tallis was found guilty of head butting but has been let off with a caution. Judiciary chairman, Vince Bruce, QC took the young forward's previous clean record into account but warned Tallis, "Don't come back again". Sydney Football Stadium, 23 May 1994: St George centre and Queensland Maroons winger, Mark Coyne has scored the match winning try for Queensland in the 1994 State of Origin against the New South Wales Blues. With one minute to go and trailing 12-10, the Maroons began deep in their own half. The ball went through 10 sets of hands before Coyne took the final pass to score. poste script: Series was won by NSW, 2-1. The decision enables Tallis to play in the State of Origin decider. Tallis was sent off by referee, Greg McCallum after the St George second rower was seen to have made a 'deliberate lunging action' with his head against Newcastle centre, Jamie Ainscough as the pair struggled on the ground. The defence claimed that Ainscough deliberately struck the side of Tallis' head and that his actions were 'defensive, not retaliatory'. Tallis was reported to be 'very happy with the decision'. Brookvale Oval, 3 July 1994: Nothing could prepare Dragons supporters for what was to happen on a Sunday afternoon in July. In front of 22,380 people, the Manly Sea Eagles scored no less than 10 tries to nil to slaughter the St George Dragons 61-0. This was the biggest ever loss suffered by the proud club and has surpassed the previous record of 55 - 7 (11 tries to 1) against Newtown on 26 August, 1944. This was the low point in a miserable year for the Dragons. With the season over, rumours starting circulating that St George and Eastern Suburbs administrators were entering into talks which would see the clubs merge into one. Rumours suggested that the St George name, colours and jersey would disappear. Saints fans were outraged by this and lobby groups were formed. It has been confirmed that local lad, Brad Mackay will be joining new club, Perth's Western Reds in 1995 as their captain. The follows reports of a rift between coach Brian Smith and the international utility player. Mackay has for some time been touted as a possible captain for the Dragons but was overlooked for the job in 1994. Brad joins the other former Dragon, Mick Potter who is coming out of retirement to also join the Reds. Brad Mackay could play lock, centre or five eighth and it was this versatility which saw him gain representative selection. Between 1987 - 1994, Brad played 108 games (9 replacements) for the Dragons scoring 22 tries and 14 goals (114 points). A local junior, he represented NSW 10 times (1989-95) and played 11 Tests for Australia (1990 & 1992-93) making a memorable debut against France in 1990 when he scored a hat trick of tries. 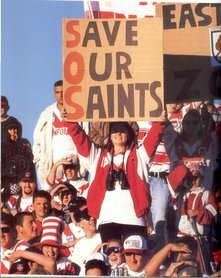 1995 was marked by regular appearances at games by the 'Save Our Saints' (SOS) group. The group was protesting against the proposal to merge St George Dragons and the Eastern Suburbs (Sydney City) Roosters.. It became fact that throughout 1995 certain officials were holding talks with various clubs with the view of amalgamating. On the eve of the 'Super League War' (more below), an almost farcical 'cloak and dagger' routine developed with St George, Cronulla, Canterbury and Illawarra being the subject of a number of possible merger scenarios in southern Sydney as part of the News Ltd-backed rebel competition. One such meeting saw Cronulla CEO Peter Gow proposing a laughable blue jersey for a southern Sydney Cronulla-St George franchise called the 'Gladiators'. Relocation to Melbourne and Adelaide was also suggested amidst an atmosphere of News Ltd repeatedly pushing for Saints to join the breakaway league. Most of these talks broke down with the St George board eventually siding with the Australian Rugby League (ARL). By 1995, the old NSWRL 'Sydney Comp' had evolved into a national competition beyond New South Wales. The national premiership was now being administered under the auspices of the Australian Rugby League (ARL) and re-branded as such. But the merger-talks were not over and a serious proposal from the Roosters CEO Nick Politis to join forces was very much on the table. It had the backing of a number of officials from both clubs including Saints' CEO Geoff Carr. The plan was for a merger that would see the demise of the name, jersey and colours of St George. As soon as the news broke, 'SOS' banners became commonplace at home games, rallying supporters together to ultimately put a stop to the plan. On July 23, a rally with over 3,000 supporters took place at Kogarah Oval. On August 3, SOS organisers threw down the gauntlet to the club, threatening to call an Extraordinary General Meeting and move against the board. Later in August 1995, SOS staged an information night at the St George Leagues Club auditorium. 'People power' ruled proceedings with over 1,100 angry and vocal supporters in attendance. The merger plans were buried one week later, and Geoff Carr was dumped following a 6-2 vote on the board. Interestingly, there was very little, if any, protest from the Roosters fan base. The Dragons finished the 1995 season in 7th position, qualifying for the eight team semi-finals. The Steelers had an inconsistent year and ended their season three points outside of the top eight in 12th position. Western Australian Cricket Association (WACA) Ground, 12 March 1995: In their first ever first grade match, the Western Reds have defeated St George 28-16 at the WACA ground in front of 24,932 people. The Perth team, with ex-Saints, Brad Mackay as captain and Mick Potter (brought out of retirement) at fullback scored five tries to three to secure victory. Another ex-Dragon, 'Lord Ted' Ted Goodwin, now living in Perth, was a 'Reds' administrator and played a big part in getting a Perth team into the competition. For the first time, the season opened with 10 matches of football. Surprisingly, the Australian Rugby League, under the leadership of Ken Arthurson, had issued invitations to Auckland (Warriors), Perth (Western Reds), South Queensland (Crushers) and North Queensland (Cowboys) thus creating a competition with 20 teams. The competition was now spread wide and the premiership no longer resembled the once local Sydney-based competition. With so many teams, it was decided to introduce an eight team semi final system. Brisbane, 1st April 1995: The outbreak of hostilities between the ARL and the News LTD backed Super League began today when John Ribot resigned from his post with the Brisbane Broncos to take up the new appointment of Super League CEO. Later known as the 'Super League War', the conflict would cause crippling damage to the game's image as both sides fought over players, teams, sponsorships and broadcast rights. Following a number of well documented and costly dramas off the field, St George rejected offers to join Super League. Illawarra also had their share of controversy with coach Graham Murray being sacked for organising meetings between Illawarra players and Super League officials. A local club, Wests Illawarra, were reported in the Illawarra Mercury as being a potential Illawarra Super League club. Illawarra also rejected the breakaway league and remained loyal to the ARL. 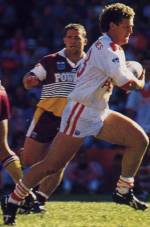 Kogarah, 6 May 1995: St George and Illawarra met only once in 1995, St George coming away with a 34-8 win. Saints scored six tries to one in front of 4,525 people. WIN Stadium, 27 August 1995: Illawarra missed out on a shot at the finals but completed the year with a big win over Wests by 46-6. Other highlights included victories over Brisbane by 34-18 (round 12), Parramatta by 52-12 (round 16) and Newcastle by 28-6 (round 18). Sydney Football Stadium, 2nd September 1995: St George have gone down to eventual premiers Canterbury in the elimination Quarter Final. Both teams scored one try each with Canterbury kicking two extra penalty goals. The referee was Kelvin Jeffes.